The better portion of my college years were spent studying music theory and composition. For this reason I am gratified and impressed with the music software available for the Atari ST computers. Sequencers, sound digitizers and other types of software unknown to me a couple of decades ago have opened a whole new world of possibilities to me. Learning to control the possibilities is another matter. Fortunately, help has come from Steve MacMillan in the form of Music Calc. Music Calc V1.05, a program which runs in medium resolution, is composed of three elements: a numerical calculator, a time-based calculator and a calculator for determining position within a musical piece. The numerical calculator, the simplest of the program's elements, provides the four basic functions: addition, subtraction, multiplication and division. The values are entered, the symbols are chosen, and the answer is returned. No bells or whistles here, this is simply a tool that has been provided as support for the other functions. The time-based calculator can be a great help when trying to determine the length of an album side or which songs, based on their length, will fit on a 45-minute cassette. Time units are entered on the keyboard and can be added or subtracted. The time values can also be multiplied and divided by real numbers, the results of the manipulations displayed in time units. If you want help adding something like four minutes, 37 seconds, nine minutes, 46 seconds and six minutes 58 seconds, this function will prove handy. The meat of Music Calc can be found in the extensive third portion of the program. The selection of the "Tempo" button allows the user to determine the speed of a song. A number of time signatures are available, in addition to the ability to enter one not displayed. To calculate the time setting, the TAP box is chosen. Pressing the spacebar begins the the real time which corresponds to the musical timing. In the example mentioned, I noted that the half note took 1005.03 milliseconds, the eighth note 251.26 milliseconds and an eighth note triplet 335.01 milliseconds. Time for four bars was determined to be 8.04 seconds. The "Bar#" screen helps determine the position within a song. The two modes associated with this choice are called "Calc Bar" and "Calc Time." Choosing the former, a selection of bars or beats is made. The bar or beat number is then entered and, as signified by the formerly computed timing, and the amount of time into the piece is then calculated. If the Calc Time option is chosen the number of bars or beats into the song is determined. Two other handy features are the stopwatch and metronome. 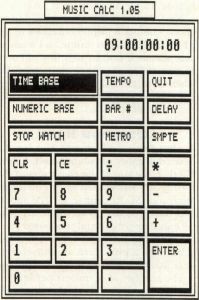 The stopwatch timing, and tapping the spacebar 16 more times to the beat of the music gives the program the information necessary to calculate the musical speed. This done, the calculated timing will be displayed and can be used in other sections of the program. While testing this feature, I determined that a section of Brahms Symphony #4, which had the quarter note written to equal 120 in 4/4 time, was 119.3 in the recording I was playing (very close). The "Delay" window can then calculate claims accuracy to 1/100 of a second. Checking it with my stopwatch, I found it to be at least this accurate. The metronome feature clicks at the rate selected on the "Tempo" screen. Trying different settings allows the composer to hear what the written time settings are like, i.e., the difference between the quarter note equaling 112 and or equaling 120. Of course this can also be used to keep steady time when practicing. The SMPTE screen allows the user to alter the default frame rate of 30 to 24 or 25 frames per second, the former being the film standard and the latter being the European EBU standard. Thirty frames per second is useful in nearly all audio productions. When leaving the program, the user has the opportunity to save the tempo, time signature, start time and SMPTE frame rate to be used as default values the next time the program is booted. This is helpful to the user who is working with synchronization of a film and musical score. Steve MacMillan has added a useful program to the library of ST public domain software for musicians with Atari STs. Even if you have no immediate use for Music Calc, make sure that you save a copy from this month's disk. One never knows when the music bug will strike. 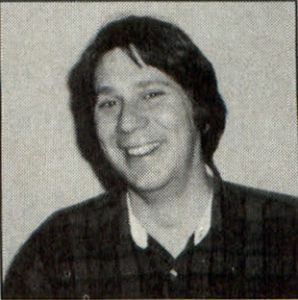 George L. Smyth has a degree in psychology from West Virginia University and is currently employed as a programmer. He is the author of a series of tutorials on programming in FORTH.